Today my fourth son turned 6 years old. Yesterday I reminded him it was his last day to be five. He pondered for a moment and said he’d like to stay five. Why? I think he had quite a crush on his Kindergarten teacher. He said he wanted to be five again and again so he could be in Miss Kistner’s class forever! I had to do some shopping this afternoon and invited him along on a trip to Kmart. I love when I get a chance to spend alone time with each of the boys. I told him he could pick out a birthday toy since it was his birthday. I was expecting Legos or an action figure. Nope. He wanted the SpongeBob skateboard. I tried to sway him toward something a little less dangerous, but he was set on the skateboard. I explained that he’d have to wear a helmet and pads on his elbows/knees. Tonight he tried it out. Within 15 minutes he had a wipeout. For some reason I’m envisioning an ER visit in my future! Also, I’ve been working on a feature story on baby name trends. I LOVE writing about baby names. Reminds me of when Brandon was born 6 years ago today. I was due July 23 and was having contractions on my due date after my OB stripped some membranes in the office that morning. While I was on the sofa trying to take a nap, the door bell rang. It was a delivery of my second book which was set to be out in stores that week. I was so excited, but didn’t even open it to look inside. Within a couple hours I was on my way to the hospital. We knew we were having another boy and I loved the name Conner. My husband wasn’t so keen on it because we already had two boys with “C” names. So, the alternates were Brandon (his choice) and Justin (mine.) All three of the other boys were named before they were born, although I did have a last minute change on my second one’s middle name. When our fourth one was born, we still weren’t sure what we’d call him. We pondered it for a couple days and figured we needed to decide. Neither my husband or I had a strong preference, so we decided to let our oldest son, who was 9, choose the name. When I was pregnant with my second son and he was four-years-old, he was adamant about naming his brother Elwood Butter. He was crushed that we weren’t as enthusiastic as he was about the name choice. This time we gave him three choices: Brandon, Conner or Justin. He settled on Brandon and Conner seemed a good fit as a middle name. I think he liked it because it sounded like his name, Bradley. I did have second thoughts and considered calling him by his middle name, but after calling him Brandon for a few hours it seemed to stick. Hard to believe it was 6 years ago today. He was my easiest of the labors and the largest of my boys (go figure) at 8 lbs. 5 oz. He didn’t quite make it in on his due date and waited until the wee hours of the morning to arrive. Wow how time flies! Well, it’s been a while. Thought I’d check in. Summer has been busy and going fast. We took a nice trip last week through Indiana Amish country and Michigan. I always manage to pack quite a bit into one trip. We toured an Amish farm, spent time at an indoor water park, fed giraffe at the Binder Park Zoo, toured the Adventist Village in Battle Creek, tried out exercise equipment like that used on the Titanic, went to a butterfly release at a children’s garden, pet a baby alligator and sat in a spaceship cockpit simulator. It was a fun adventure. Today I was up before 5 a.m., which is very unusual. I tried to go back to sleep, but by 5:45, I realized it wasn’t happening. I hopped on the computer and figured I’d spend an hour tending to e-mails and try to clear out the inbox a bit. Nearly three hours later, I’d gotten through only the last month of e-mails. I take care of those that need immediate attention right away, but it took a while to sort the older ones into folders, delete them and respond to them. Working at home, the summers are always challenging. Not only am I maneuvering around five children and keeping up with their schedules, there’s the constant distraction of the beautiful weather outdoors. Sitting by the pool is way more fun than sitting at a computer. I sometimes push work back until late in the evening just to enjoy the boys and enjoy the day. Some days, however, deadlines are quickly approaching and have to be taken of. As is the case today. Good thing it’s chilly and gloomy outside this morning. My husband's co-workers and I are forever giving him hard time about all the stuff he collects. He likes tinkering in the garage and before he was a firefighter he was a fabricator and a maintenance mechanic for a food manufacturer. 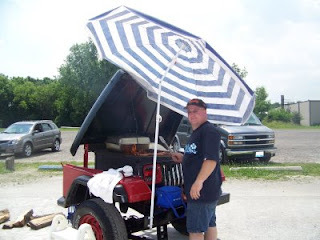 Here's his latest project, a towable grill made from a 1995 Jeep. Lift the hood and you can do your grilling. Pretty cool! Ok, I could go on and on...I have much to be thankful for. I'll bet you do to.